It's time to talk about the next mid-size shawl in my upcoming book, Sock-Yarn Shawls II. It's Demeter. You'll notice that there's more shawls with this construction in my book. The reason? I took a class with Myra Wood at Stitches Midwest last year about pi shawl construction. I've been incorporating pi-shawl shaping into my many of my shawls ever since! I love the challenge of getting the stitch pattern to fit with the pi shawl increases. And I love the way the finished shawls drape. I may or may not have another half-pi shawl design on my needles right now. I wasn't kidding that I'm obsessed. 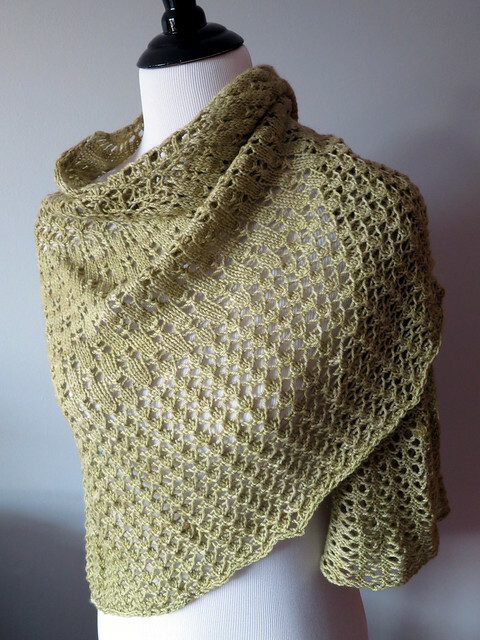 Stay tuned for Thursday, when I'll be talking about Lycopod, the cover shawl!